A hollow way takes up the width of the lower edge of the image, and leads towards the centre of the photo. There, a small burn flows from left to right; it is one of those that join to form the Spouts Burn, in the area shown in NS4379 : The Spouts Burn. Behind the photographer's position, there is a braided track, but those tracks converge, becoming a single deeper track, at the point from which the photo was taken; that single track continues towards the burn. Behind the photographer's position, the braided tracks came, ultimately, from about NS42147791, about 2 kilometres to the south-west, in the vicinity of Maryland Farm. In fact, they are part of the same extended system as those shown in NS4377 : Ancient trackway and NS4377 : Ancient trackway (see NS4377 : Dry-stone wall for further comments, and for evidence of their antiquity). This extended system of tracks appears to link sites that were connected with the local limestone industry. See Link for further details, and for references. In satellite imagery, this network of tracks is best followed using Google Earth's "historical imagery"; specifically, with the images dated Jan 28th, 2005: in that dataset, the sun's angle of illumination is exceptionally shallow, revealing many details that would otherwise be indistinct. From the area shown in the present photograph, the tracks turn abruptly to the south-east, before heading east again; they lead to other green disturbed areas, whose appearance suggests that they were places where surface outcrops of limestone were quarried. Some of those green disturbed areas are centred on NS43977904, NS43987911, and NS44127914 (shown in NS4479 : Site of former limestone quarrying); similar disturbed areas are visible elsewhere alongside the tracks. 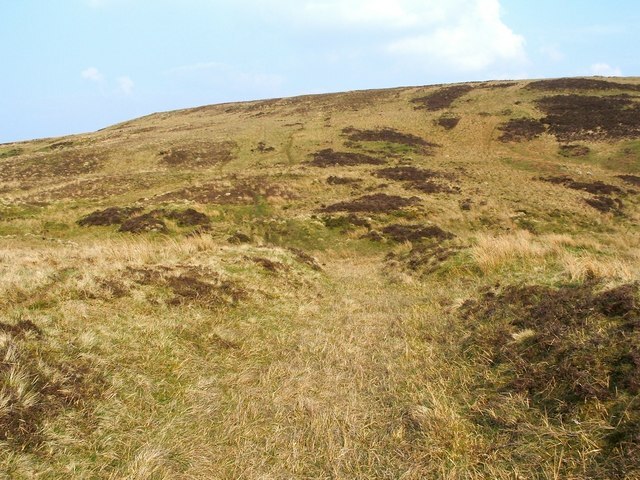 A very extensive network of ancient tracks on the moors in West Dunbartonshire links old quarries, ruined lime-kilns, and other sites connected with the local limestone-burning industry, which flourished in the 18th century. See Link for a Geograph article about the network, and Link for an annotated satellite view of it.